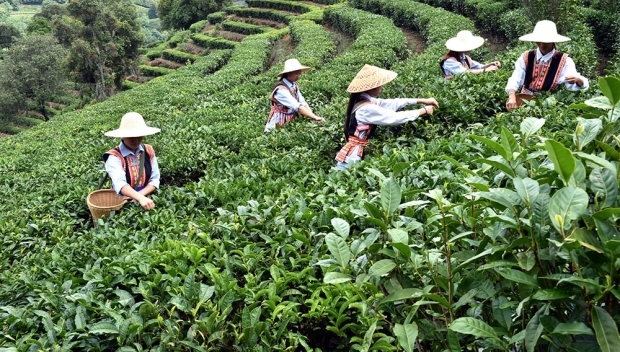 Tea growers harvest tea leaves in the Eshan Yi Autonomous County, Yunnan province. “These men always have machetes,” shouts the driver. Through trees along an unpaved road, he spots a ramshackle hut, slows down, and warns his passengers: this is a checkpoint. It’s the only way to enforce rules in this part of the jungle, at the top of a mountain in southwestern China, he explains. They inspect every incoming car. If they find something they don’t like, the self-appointed enforcers don’t bother to call the police. These little outposts, usually staffed in rotation by two male villagers at a time, dot the mountains of this part of tropical China, near the border with Burma. Their purpose has nothing to do with ethnic conflict, religious disputes, or national borders. Instead, they police movement of an ancient crop today essential to the region’s economy: pu’er tea, a dark brew celebrated for its bitter flavor and sweet aftertaste, believed to aid in digesting greasy foods, and, recently, valued among connoisseurs as a link to China’s past, driving prices sky-high. A cake of compressed pu’er from premium villages in Yunnan is now more expensive, by weight, than silver. When on duty, checkpoint guards ensure that no unauthorized tea is transported into nearby villages and sold under false claims of origin. As with fine wine, the terroir matters: unregulated tea can damage a village’s reputation and its economy. In 2008, locals got worried that “fake” pu’er was spooking buyers and jeopardizing prices, so they ramped up the checkpoints. Penalties for tea smuggling are steep: One recent violator was forced to offer an expensive sacrifice—a water buffalo—and serve his whole village a banquet. Another was driven out of his hometown; he now lives on the other side of the mountain. Selena Ahmed, an American ethno-botanist, was already waiting for us in the tea village. Through extensive interviews with local farmers, Ahmed, co-recipient of a research grant from the U.S. National Science Foundation, has compiled a detailed record of tea prices in Xin Banzhang, where high-end pu’er is grown. In 1985, Xin Banzhang farmers were paid just 45 cents for a dried kilo of spring pu’er tea. That rose to 75 cents in 1995, and then $1.46 in 2000. In 2003, the state-owned enterprise that ran Yunnan’s monopoly, the Menghai Tea Company, was broken up, opening the market to private entrepreneurs. By 2010, the price for a kilo of spring tea was $220—a 150-fold increase in a decade. The price tumbled in 2008 and 2011, (many locals believed the “fake” pu’er was to blame) but the general ascent continued. By this spring, Xin Banzhang farmers were hauling in $713 per kilo—roughly $200 more than a kilo of silver. Yunnan’s tea pedigree is not new. During the Qing dynasty and Republican periods, Xishuangbanna officials paid tribute to Beijing in the form of tea harvested from the Six Famous Tea Mountains. But by the mid-20th century, following decades of political upheaval, this legacy was largely forgotten in mainland China. As anthropologist Jingzhong Zhang notes in her delightful book, Puer Tea: Ancient Caravans and Urban Chic, during her childhood in Yunnan she rarely ever heard about pu’er tea. One Saturday morning in late March, Ahmed, Su, and I hiked to the top of Yunnan’s Nannuo Mountain to witness a festival marking the start of the spring harvest. In a tree-cleared area near the summit, we strolled past two lines of plastic folding tables, where tea-farming families waved at potential customers to sip their wares. As we approached one table, a teenage boy wearing a feathered cap motioned for us to pull up a stool. He poured hot water from a metal kettle into a small porcelain cup packed with freshly picked tealeaves. He then used that tinted water to cleanse two tiny round glass cups. He served us the third infusion, which, Ahmed whispered, is said to have the richest flavor, with “an aftertaste like honey” at the back of the throat. Traders now come here from eastern China, Hong Kong, Taiwan, and Southeast Asia to sample the freshly picked tea and rate its flavor, aroma, and other characteristics, and to negotiate a price. Small differences in cultivation techniques, soil chemistry, and mountain microclimates—a hillside that gets more or less sun and rain, for instance—can impact the quality of the tea. At around 11 am, a half dozen village elders formed a line to belt out a traditional song offering thanks for the tea harvest. They passed among themselves a ceremonial wooden goblet of tea, and the last man clutched a squirming rooster, soon to be slaughtered. About 15 minutes later, their hymn was drowned out by a modern speaker system. A professional emcee—a young man in a suit with a microphone, greased hair, and a Beijing accent—stepped onto a wooden platform stage and began welcoming visitors to the mountain and thanking the event sponsor, national telecom giant China Mobile. Today the festival attracts a few hundred tourists, mostly from eastern China, all eager to see the birthplace of pu’er. Emerging from cars parked along the steep gravel road, the modern tea pilgrims sport floppy sun hats and Rayban sunglasses, marking them as wealthy urbanites, who yet clamor for something authentic—a link to the past, something pure; this is a deeply understandable impulse, even if the scene is a bit humorously oxymoronic. Standing between two minority farmers dressed in colorful plastic-beaded costumes, apparently mass-produced versions of traditional garb, one smiling Beijinger in a Los Angeles Police Department t-shirt handed me her iPhone to take a quick photo. An average household in Xin Banzhang sells more than 100 kilos of pu’er tea each year, and top producers sell 220 kilos, according to Ahmed’s research. Seasonal growing conditions greatly impact the flavor and aroma, so leaves harvested before the monsoon rains fetch prices that may be double that of other seasons. Annual household income in the village varies, but can easily reach up to $50,000, or even more for some households. That’s many multiples China’s per capita GDP, which hit $7,593.90 last year, according to World Bank statistics. In Yunnan, which is one of China’s poorest provinces, last year the governor pledged to help more people surpass the annual income poverty threshold of just 2,300 yuan ($380). Pu’er money is rapidly changing the mountain, much like oil wealth in a 19th century Texas boomtown. At times when he’s not joining his family in the harvest, Lao Dah, a short and jovial 48-year-old Akha patriarch in Xin Banzhang, goes to inspect the earthmover by a bend in the road outside the village gate. This is where his new home will be. One afternoon, the botanist Su and I stand beside him, watching the machine pull out tree roots with its metal claws. Underneath the deep brown topsoil, a layer of reddish clay is exposed, the remnant of an earlier geologic era. It’s strangely hypnotic, seeing the earth churn: tree trunks wiggle a little, then shake furiously, and finally collapse downward in a volcano of dirt. As soon as one blue dump truck is full of soil, a workman drives it away and another comes to take its place and wait. Su, who has visited this village annually for eight years, whispers to me that this will be the third of Lao Dah’s homes he’s seen; he built the last one seven years ago. “Lao Dah, why are you already building a new house?” the botanist shouts above the construction noise. To the tea farmer, the answer seems obvious, hardly worth verbalizing. “Otherwise the neighbors will talk,” he shrugs, then bats a fly from his neck. Sometimes the residents seem slightly baffled by their own wealth. Lao Dah says he has no desire to move anywhere other than this tiny mountain village. In fact, he has rarely traveled to China’s big cities, never mind seen the homes of Beijing and Shanghai millionaires, except in photographs. Despite the fancy new exteriors, inside the homes far less has changed. There is scarcely any furniture in Lao Dah’s house, just some beds, bamboo stools, and a rattan table hung from a wall. For the Akha minority, which has Tibeto-Burmese roots, it’s tradition to remove the table after a meal, lest empty place-settings attract ghosts. Bare light bulbs dangle from the ceiling. On weekend mornings, village loudspeakers still crackle with rousing patriotic music, followed by mundane government announcements. When Su and I stop by, one of Lao Dah’s sisters is cooking porridge over an unventilated wood-fired stove. On the ceiling above, the smoke has formed a black stain. Outside, two pigs oink in a stone pen. After sunset, the streets of Xin Banzhang are dark; the new money has not yet yielded streetlights or improved social services. Villagers navigate by the light of the moon, and today, their iPhones. Worldwide, the lives of farmers are frequently disrupted by forces far beyond their control, from market swings, to the arrival of oilrigs and speculators, to climate change. Often the impacts are devastating, but in Xin Banzhang’s case pu’er’s rising cache has been a windfall, at least for now. Over the past decade, farmers like Lao Dah haven’t done much different, beyond converting an increasingly large portion of their land purely to tea and marketing artisanal preparation techniques, as buyers fork over surreal amounts of money for the same product. Rising fortunes came not through ambitious plans, but largely because of mysterious demand in faraway places. But there are risks, too—also beyond the farmers’ control. As fine pu’er has come to be seen as a luxury item, like wine or jewelry, a heftier price tag has come to signify higher value, whether or not it’s a superior product. He points to a box on the top shelf containing a 1.4 kilo dried brick of ultra-premium pu’er tea. “This is if you want to give someone the best,” he suggests. The cost of the gift: 12,000 yuan ($1,875). “One of the major markets for very expensive pu’er is government officials,” Ahmed told me at another time. “That market driver—well, a lot fewer people seem to be purchasing pu’er from the farmers this year. Some tea buyers who came to Yunnan are even saying they have overstock from last year.” As President Xi Jinping’s far-reaching corruption crackdown rolls into its third year, many once-popular gift items—from mooncakes to moutai to fine tea—are staying longer on store shelves. This year, Xin Banzhang still sold out its pricey spring pu’er harvest, Ahmed told me, but some of the nearby villages did not. With softer demand, a few regions of Xishuangbanna that had been selling less premium tea are already converting fields back to rice. The Six Famous Tea Mountains are unlikely to become paddies too soon, but it’s possible the pu’er money will slow to a trickle before Lao Dah has time to complete his fourth home.